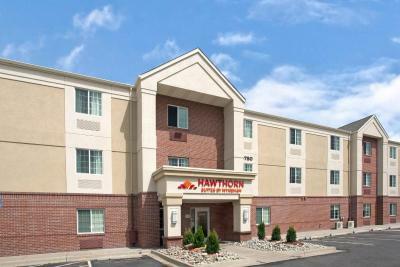 Lock in a great price for Hawthorn Suites by Wyndham Denver Tech Center – rated 8.1 by recent guests! It is a very comfortable accomodation in south part of Denver (Centennial), about 12 km from the downtown. Our studio was large enough & very commodious with a well equipped kitchenette. But by open window You have to count with big noice of traffic & landing airplaines. The buffet dinners from Tuesday to Thursday & the breakfasts (all included in the room-price) were served with a good choice and it was very tasty. The counter staff who helped me with my confusing booking. I had to book two reservations for my trip and the front desk staff was able to combine my reservations so I didn’t have to check out/in to another room. The guy that made breakfast (Ronald, I think) was a great guy!!! The breakfast bar was well appointed. It was close to the highway. The facility was clean, comfortable, and staff were extra pleasant. Everything but location. I had to travel too much , but that couldn't be helped...afters all it is a big city area. Hawthorn Suites by Wyndham Denver Tech Center This rating is a reflection of how the property compares to the industry standard when it comes to price, facilities and services available. It's based on a self-evaluation by the property. Use this rating to help choose your stay! One of our best sellers in Centennial! Located a 7 minute drive from Denver Technological Center, this Centennial hotel offers traditionally decorated studios with kitchenettes. It features BBQ facilities and a 24-hour convenience store. Free Wi-Fi is available in all studios. A cable satellite TV and a DVD player are included in every air-conditioned studio at Hawthorn Suites by Wyndham Denver Tech Center. Each studio has a work desk, ironing facilities and a hairdryer. A 24-hour front desk greets guests of Hawthorn Suites. Guests can borrow DVDs from the hotel lending library and relax with a DVD in their room. If they prefer, guests can work out in the on-site fitness center. Centennial Airport is 5 miles from this hotel. Wells Fargo Theatre is a 20 minute drive away. Home of the Denver Broncos, Sports Authority at Mile High is 15 miles from this hotel. When would you like to stay at Hawthorn Suites by Wyndham Denver Tech Center? This studio features a toaster, seating area and dishwasher. This suite features a kitchenette, air conditioning and dishwasher. This suite has air conditioning, dishwasher and kitchenware. This double room features a iPod dock, kitchenware and air conditioning. This studio has a dishwasher, microwave and kitchen. Work on your important presentation in our business center and then enjoy snacks and drinks from our deluxe vending area. Enjoy free hot breakfast daily in our renovated breakfast room, as well we offer three Manager Receptions midweek . Always stay connected with free Wi-Fi Internet access. When you’re ready to work out, visit our onsite fitness center. Take advantage of our onsite coin-op guest laundry facilities and outdoor barbecue grilling area. Our comfortable extended stay hotel suites feature convenient amenities like fully-equipped kitchens and spacious work areas in every room. House Rules Hawthorn Suites by Wyndham Denver Tech Center takes special requests – add in the next step! Hawthorn Suites by Wyndham Denver Tech Center accepts these cards and reserves the right to temporarily hold an amount prior to arrival. There seemed to be a bit of an odd crowd at this hotel. Could have just been during our stay. On the day we checked out we heard some many yelling, perhaps in an argument with a partner or friend, and pounding on the door and scream. This went on for a little bit before someone took care of it, but I found it a bit alarming. Our room was on ground level, and if we kept the curtains open but left the light (see through) ones, it still felt very uncomfortable when anyone would walk by. The window was facing the parking lot. Natural light is always nicer, so perhaps blinds or a reflective surface on the windows so people can't see in would be nice. I know when we arrived we could see in to peoples rooms, not on purpose but because their curtains are open and you are walking right next to them. This is definitely something that could be improved upon. The room was quite nice with a kitchenette and full sized refrigerator. Comfortable bed and plenty of pillows. The breakfast was very nice. It changed a bit every morning, but you could always make waffles, and they had fresh fruit (bananas, apples and oranges) cereal, toast, english muffins, and pastries to choose from. The part that changed was the warm food: it ranges from eggs and bacon, biscuits and gravy and sausages; to eggs, sausages and biscuits. The man working the breakfast in the morning was very helpful and was quick to tidy up any trash or spills. Also, Tuesday, Wednesday and Thursday they provide a light dinner. We were only around for Wednesday night since a snow storm hit then. It was soup night. Nothing fancy, but there offered two soups: clam chowder and a tortellini soup. There were also cookies for dessert. Basic, but nice. If you have a car, this is a great place to stay since it's near route 25 and you can easily drive to wherever you need to go. If you're only using public transportation, it may be more difficult. There were lots of stores and restaurants nearby too which was nice. Amazing choice for breakfast from cold to hot! Suite had ALL amenities plus! Easy freeway access! Friendly and helpful staff. Great breakfast. The bed was HORRIBLE!! Felt like sleeping on concrete. The toilet is super tiny. The hallway smelled of pot and a dog barked half the night. We left a day early because we couldn't stand another night. Physically painful. Friendly staff. Extra towels, pillows available. I stayed for 2 nights my room was adjacent to the laundry room so it was very noisy and I could hear guest running the laundry machine after midnight. The towels were stained and dirty. The fridge was extremely loud and should be replaced, It kept me up. Everything else seemed ok, I probably would not stay there again however. There was a lady cutting her daughter's hair in the laundry room. Thought that was kind of odd. The service. The lies they told you on the phone only to get there, 1100 miles from home just to be told we can’t stay there. At first I was excited about our stay. I called TWICE to make sure my reservation was still good, and that my payment would be handled correctly, I was going to pay with my debit but ended up calling and asking them if I could pay with cash and they said that would be fine, and even made a note in the computer about it. We arrived at the hotel around 11 pm, only to find out we needed a major credit card. AND would have to pay a 100 dollar deposit on top of our areservation price. Meaning instead of 180 dollars for our stay we would have to pay almost 300! I was not told about the 100 dollar deposit both times I called to make sure my reservations were still correct, and then to be told they don’t accept cash payments. That it had to be on a major credit card or debit card. Come to find out Colorado did not have our bank we use back home, which we were going to try and go to the bank, put our cash in our account then pay with the debit card. In the end the front desk associate could care less that we were stranded at 11 pm at night in a town we hadn’t never even been before. This was the worst experience I’ve had traveling, and I would not recommend this hotel to anyone else. The drawers in the suite were not quite clean. The gentleman named Rodney who attended to me during breakfasts was a very pleasant and caring individual, and is a superb ambassador for this hotel chain. Rodney, thank you for your excellent attention to guest satisfaction! Above and way beyond expected service. While I felt safe I learned there is a prison near and I believe many of the customers were staying there while seeing there loved ones. with this in mind everyone was well behaved and we had a good night sleep.